Darryl Tweed from Ballymoney won the Ultra-Lightweight race at the Manx Grand Prix. Picture: Dave Kneen. Ballymoney’s Darryl Tweed made up for the disappointment of running out of fuel in the Junior race at the Manx Grand Prix by clinching victory in the Ultra-Lightweight race. Tweed ran out of fuel while holding third place on the final lap of the Junior MGP, denying the Ulster rider a coveted podium finish on Wednesday. James Chawke took the spoils in the Junior Manx Grand Prix. Chawke is pictured here in the Lightweight race on a Paton. Picture: Dave Kneen. However, he made up for his misfortune by dominating the Ultra-Lightweight race to win by well over a minute on his M&D Racing Kawasaki from Daniel Ingham (Derek Jones Honda) and Alex Sinclair (CSC Yamaha). Irish riders dominated yesterday, with James Chawke (Carl Roberts Racing Kawasaki) from Rathkeale sealing victory in a dramatic Mylchreests Junior race after Yorkshire's Matt Stevenson crashed out unhurt at Creg-ny-Baa on lap two while holding a lead of half-a-minute. The race had been delayed by two hours until 12:15 to allow mist on the Mountain section to clear. Following Stevenson’s demise, Chawke won by only four seconds from Manxman Dean Osborne (Kawasaki). Kendal's Stephen Parsons was promoted top third on the peoplesbike.com Kawasaki on the last lap when Tweed ran out of fuel at Quarry Bends. Race winner Chawke said: “I can’t believe it. It’s such a dream to come up Glencrutchery Road a winner and follow the likes of John McGuinness. Tuesday’s Newcomers ‘A’ race winner, Thomas Maxwell from Westmeath, was the highest placed newcomer in 16th place. Later in the afternoon, Andy Farrell from Skerries won the Lightweight race as Irish riders filled the first three places. As a result of the earlier delay due to mist, Clerk of the Course Gary Thompson reduced the four-lap Lightweight event to three laps. He also introduced a compulsory ‘stop and go’ pit-stop, regardless of refuelling requirements. James Chawke, fresh from victory in the Junior race, had been the early leader before Farrell, who finished as the runner-up last year, moved into the lead on his Kawasaki by the end of the opening lap with a speed of 114.060mph. Chawke was three seconds back, with Gary Vines almost a further second adrift in third. Vines retired at the 33rd Milestone on the second lap, allowing David Lumsden to move up to third. Farrell remained in the lead and wrapped up victory by almost 16 seconds on the final lap from Chawke, with Lumsden securing third. In Wednesday’s Manx Grand Prix races, newcomer Stephen Haddow came off in the Junior race at the 27th Milestone and sustained soft tissue injuries. He was admitted to Nobles Hospital for further assessment and was described as comfortable. 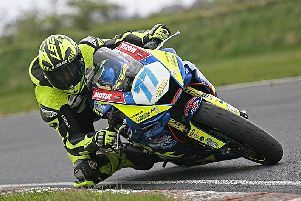 Stu Hall from Stafford was taken to Nobles with arm and ankle fractures following an accident at Brandywell during the Junior race. He is described as stable.